Apostolic Revelation: Ask the Lord to Break You In Order to Use You! Ask the Lord to Break You In Order to Use You! I have always asked the Lord this question, "Why me Lord? ", whenever I would face adverse circumstances that has totally shattered me in the natural physical realm. I never got an answer from Him, until recently I began to get more understanding and wisdom form the word of God. For example when I finished my Engineering I had a dream for myself and I thought of going in to some good fortune 500 companies in the west and always expected to settle myself quietly in it. I also had some religious thoughts of helping the Church financially through my life, because I thought that my upbringing inside the Church had taught me all the good thing in life which I hold dear to my heart. But sad to say unexpectedly I got an arrear in a subject named as "Numerical Methods" which is one of the easiest subject in the whole of engineering module and at first I was so devastated by it. I was begginning to be broken inside me. My body became weaker and weaker just at that time, still I managed to carry myself on to finish the degree and finally positioned myself by getting in to a computer company as a trainee in the city of Chennai in South India. As I worked harder to succeed, my body began to grow weaker and weaker till one day I met with the company director to tell him I could no longer continue because of my physical infirmites. I tried to keep myself with all the positive self-determination, self-talk and positive thinking, but I grew still more desperate and broken inside me. My hands began to tremble to the point that I could no longer hide it before others and it was a great humiliation to me at that young age. The man who was absoutely ripping with all the muscles by rigorous, disciplined and a routine exercise schedule became mockingly weak. When I returned back to my home town from the big metro where I went to pursue my career, I hit the rock bottom. After returning back to my home town defeated in my purpose with broken wordly dreams, I had no strength to face anybody because of becoming useless according to the standard of the world. There working for a spiritual revival meeting, right on the day when it all got over, all my muscles got pulled up and I became immobilized due to hyper-thyroid potassium deficiency . I became broken physically, mentally and spiritually. I asked the Lord, "Why me Lord? ", there he showed me the Cross and spoke to me about how He got mocked by the people around Him when He died strengthlessly (Matt 27:27-31, 39-44). At this time I received a divine grace to go through the trials I faced as a broken vessel. A new understanding dawned on me that it was something that the Lord has allowed for my good and that He will collect the broken pieces and will begin to put together to use it for Himself. Yes this was the day at the lowest point in my life, I could sense the nearness of God through my ordeal. I believe God chooses to pour Himself inside a broken vessel because all the fragmented pieces know for sure that it needs God's continual touch upon it to keep the broken and fragmented pieces intact. The broken vessel begins to understand that because it has been plastered back supernaturally by God's sustaining Presence, it cannot withstand the pressures of life alone without Him. Without God sustaining it continuously, the broken vessel will again become hopeless vessel. The broken vessel begins to depend on God to sustain itself and continue in usefulness to God and to men. Hear how God loves to draw near to the broken vessels in Isaiah 66:2 which also deeply potrays God desire to use the broken vessel for Himself when He says, ".... this is the man to whom I will look and have regard [to drawn near to him]: he who is humble and of a broken or wounded spirit, and who trembles at My word and reveres My commands." (AMP) God taught this same truth to Jeremiah the great prophet by taking him to a potter's house. Hear what Jeremiah says, "The word which came to Jeremiah from the LORD, saying: 2 “Arise and go down to the potter’s house, and there I will cause you to hear My words.” 3 Then I went down to the potter’s house, and there he was, making something at the wheel. 4 And the vessel that he made of clay was marred in the hand of the potter; so he made it again into another vessel, as it seemed good to the potter to make. 5 Then the word of the LORD came to me, saying: 6 “O house of Israel, can I not do with you as this potter?” says the LORD. “Look, as the clay is in the potter’s hand, so are you in My hand, O house of Israel!" (Jer 18:1-6). Here we see in these above verses of how God chooses to break the marred clay vessel and again chooses to make it in to a vessel that seemed good to Him. What do we learn from this? We will be broken again and again by the Lord until we start to show forth his very own image and glory through us to others. God has called us all in to the Church so that we can all be conformed to the image of His Son Jesus (Rom 8:29). He will use all kinds of affliction to reshape us and remold us in to the image of His Son Jesus, this is the reason we can be sure that all the affliction, mockery and humiliation we face will work together for our good in the end because God is orchestrating it all so that we might be used for Himself more and more (Rom 8:28). As we are all the children of God, He has the rights over us to train us and chastice us till we all confirm to His image (Heb 12:5-11; Gal 4:1-2; Amos 3:1-3). He will do with us as it seems best for Him and finally use us for HIS GLORY by revealing Himself through us. Praise the Lord! I have learned not to resist the chastisement of the Lord. As I have given myself to His breaking willingly, the more joyfully I have enjoyed my times with God. After the broken and shattered feeling, every time I have felt His divine hand restructure me and hold me with supernatural glue. He will always fill my earthen vessel with His heavenly glory and will comfort me in my afflictions. This is the only way He has chosen to reveal His GLORY TO ALL OF US! The broken man Apostle Paul knew of God's heavenly consolation and thus encouraged the Corinthian Church by saying, "...as you are partakers of the sufferings, so also you will partake of the consolation." (2 Cor 1:7). This is the same thing I would like to tell you all who have been reading this, as you begin to open yourself to the Lord to break you, then you will begin to feel the consciousness of His Presence near you. When you go willingly through the trials that He allows and has custom designed for you in your life, you will know that you know that He is standing beside you and with you in your desperate trails (Isa 43:2). No matter how many men God allows to ride over our heads mockingly during the trials, but as we come out of such ordeals we will become a habitation for God's Presence which will glue the broken pieces of our lives together and keep us rightly filled with the goodness of His Grace deposited deep inside us to carry us in our weakness (Psa 66:12). Be broken for the Master's use. All you need to do is to allow him to do it and He will bring you in to rich fullfillment. Praise the Lord! I would like to end this article with this lovely story of how God uses broken vessels to shown forth HIS GLORY in the midst of their weakness. No wonder this is why the Apostle Paul who understood the power of being broken by God said, "Therefore I take pleasure in infirmities, in reproaches, in needs, in persecutions, in distresses, for Christ’s sake. For when I am weak, then I am strong." (2 Cor 12:10). 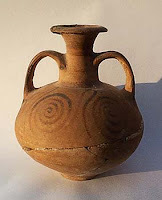 An elderly woman had two large earthen jars, each hung on the ends of a pole which she carried across her shoulders. One of the jars had a crack in it while the other jar was perfect and always delivered a full portion of water. At the end of her long walks from the stream to the house, the cracked jar arrived only half full. For a full two years this went on daily, with the woman bringing home only one and a half jars of water. Of course, the perfect jar was proud of its accomplishments. But the poor cracked jar was ashamed of its own imperfection, and was miserable that it could only do half of what it had been made to do. 'For two years I have been able to pick these beautiful flowers to decorate the table at my house. My dear friends, each of us has our own unique flaw. But it is the cracks and flaws in our lives that cause us to throw ourselves into the Grace of our Lord. He then fills our lives and makes us Fruitful. We just have to take each person we meet for what they are and look for the good that God has put in them. 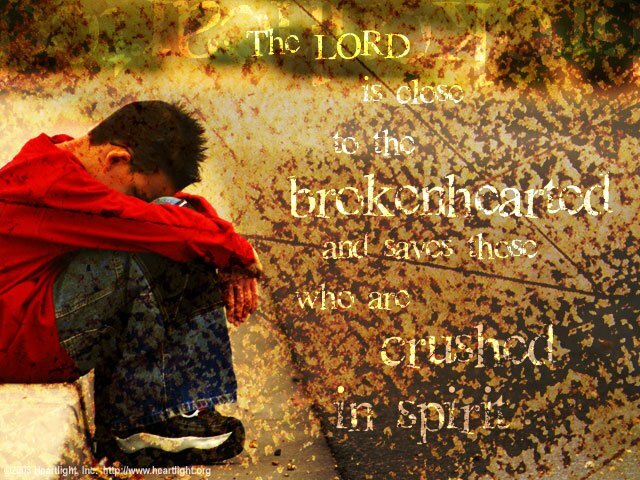 So, to all of my fellow cracked and broken friends, the one Scripture that comes to mind that describes the goodness that has been acheived by God through the way we are broken and have become foolish to the world around us is explained by this beautiful Scripture that says, " 26 For you see your calling, brethren, that not many wise according to the flesh, not many mighty, not many noble, are called. 27 But God has chosen the foolish things of the world to put to shame the wise, and God has chosen the weak things of the world to put to shame the things which are mighty; 28 and the base things of the world and the things which are despised God has chosen, and the things which are not, to bring to nothing the things that are, 29 that no flesh should glory in His presence. 30 But of Him you are in Christ Jesus, who became for us wisdom from God—and righteousness and sanctification and redemption— 31 that, as it is written, “He who glories, let him glory in the LORD.”" (1 Cor 1:26-31). So the bottomline is whatever we acheive in life, we should come to realise it is not our own strength that enabled us to achieve it, but the plan of brokenness that was preplanned by God made us get empowered to achieve greatness that others could never even imagine to acheive in their life. May we always boast in the power of our Lord and GLORY IN HIS STRENGTH! May we be thankful and praising for breaking us to become a blessing to many on the path way we walk. Let us Serve the Lord with Gladness of Heart (Ps 100:2), and do not forget to smell the flowers on your side of the path! The following poem below is a master piece that describes the beauty of the broken vessel that God chooses to use. As you read it, ask the Lord to break you, mould you, fill you and use you. May you be used as a mighty vessel for HIS GLORY!!! On the shelf there were many, which one would He choose? And for someone like you Master, Gold would be best”. And I’ll be at your table whenever you dine. It was wide-mouthed, and shallow and polished like glass. And I’m sure in your house I’d be happy to abide”. To cleanse and make it whole, and to fill it to use.